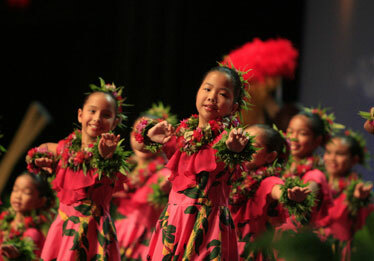 Girls from the Joan S. Lindsey Hula Studio performed the "Hana Chant" Saturday during the 33rd Annual Queen Liliuokalani Keiki Hula Competition at Blaisdell Arena. Five hundred children representing 23 halau participated in the event, which is a project of the Kalihi-Palama Culture and Arts Society. The competition was held Thursday through Saturday. 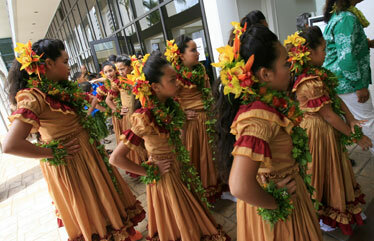 Girls from Halau Kala'akeakauikawekiu in Kona, under the direction of kumu hula Aloha Victor, prepared to enter the arena. 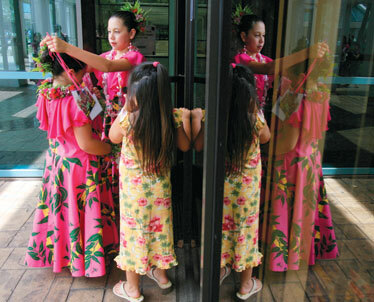 Minoaka Cravalho-Meyers, 10, put lanyards with a group photo of their halau, the Joan S. Lindsey Hula Studio, outside their dressing room.